One day last April, Arizona State University biologist Matt Chew was leading his Novel Ecosystems class along the banks of the Gila River at the Tres Rios Wetlands. The 700-acre restoration project where cattails wave in the breeze and greenery crowds the banks is home to more than 150 species of birds and animals. It’s also downstream from a wastewater treatment plant. According to Chew, the water is full of Prozac, birth control and acetaminophen and the banks are full of beer bottles, chicken-wing bones and fast-food wrappers. Chew glanced down at the river bank and saw 20 dead fish — fish that do not naturally live anywhere near the Sonoran Desert. Or anywhere in the American West. They were sailfin armored catfish that live in Florida and Latin America. They might be familiar to you from home aquariums, where they are kept as algae eaters. They’re usually in a corner of the tank, with their unusual sucking mouths affixed to the glass. Chew, an instructor in ASU’s School of Life Sciences, dubbed his find "the unexpected fish." He suspected they were dumped there. How 20 of them showed up, and big ones at that, will remain a mystery. “Practically any aquarium fish sold in the Phoenix area could be released (here),” Chew said of Tres Rios. “For the most part, what you’re going to get in here is introduced. “This gives you an idea of the weirdness of a place like this,” he said. His Novel Ecosystems class is intended to challenge preconceptions and received wisdom about the environment. The class goes to places you’ll never find on a postcard: effluent-dominated wetlands, farm fields, newer and older commercial and residential areas, fake lakes and vacant lots. Tre Rios certainly fits the bill in that regard. All the water there has come through fields, pipes and people, yet life abounds. (What’s happening to it there is anyone’s guess, however.) Lizards and hummingbirds share the wetlands with convenience-store cups and beer cans. Scientists frequently say we are now in the Anthropocene, a geological age in which human activity is the dominant influence on climate and the environment. Chew was on a plane to Australia once when he discovered a jumping spider hiding beneath the leaves of the strawberry in his fruit salad. He looked around at the cattails waving in the breeze and swallows skimming over the water. ASU School of Earth and Space Exploration graduate student Feifei Zhang examines a new drill core in Three Gorges area (Hubei Province), People’s Republic of China. This drill core includes sedimentary rocks from the Middle Ediacaran to the Early Cambrian. 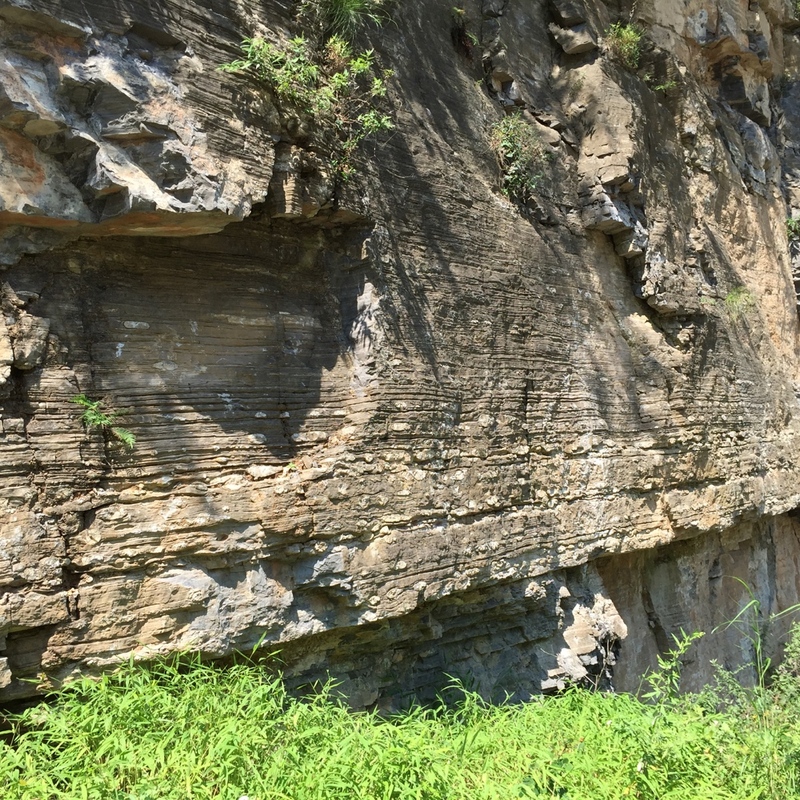 Zhang samples Ediacaran carbonate rocks in Three Gorges area in China.